Russia’s regions have calculated that creating the infrastructure for the 2018 FIFA World Cup will cost double the original estimates – closer to the amount being spent on the 2014 Sochi Olympics. However, government officials say the federal budget cannot support the regions’ demands. They hope private investors will make up the difference, instead. The eleven 2018 FIFA World Cup host cities in Russia will need a total of 1.3 trillion rubles ($41.2 billion) to prepare the necessary infrastructure for the tournament, Standard & Poor’s (S&P) said, citing an analysis of official funding requests. Social obligations account for up to 60 percent of total projected spending – an amount that is bound to increase in order to fulfill the promises made by Russian President Vladimir Putin. The Russian Ministry of Sport had estimated the spending at half the amount – 650 billion rubles ($20.5 billion) ­ – before recently increasing its estimate to 917 billion rubles ($29 billion), S&P Deputy Director Karen Vartapetov said. However, the Ministry of Sport has warned the government thatthe agency will need 1.4 trillion rubles ($44 billion) to organize the championships at an appropriate level. This is roughly the same amount as the 2014 Sochi Olympics, which is believed to cost 1.5 trillion rubles ($47.5 billion). “Appropriate” means spending will not be limited to the necessary FIFA commitments; it will also be required for such projects as building stadiums and training bases, and upgrading the airports and the roads leading from them. Those expenditures will be borne by the federal budget. The regions have made a number of requests, including requests for money to be spent on modernizing transport and utilities, train stations and road networks. For example, Samara is planning to build new metro stations in time for the World Cup; at 350 billion rubles ­ ($11 billion),­ its request accounts for more than one quarter of all World Cup spending. Meanwhile, Kazan has asked for 30 billion rubles (around $1 billion) to upgrade its roads. Kazan’s mayor, IlsurMetshin, is optimistic that the federal authorities will listen to his city’s proposals. Vartapetov believes the amount is preliminary and will likely grow. For example, Nizhny Novgorod has recently expanded its request by 60 billion rubles ($2 billion) to 280 billion rubles ($8.9 billion). Its proposed project includes the construction of new infrastructure facilities “of critical importance to the city’s development,” according to the municipal administration, as quoted by the local media. By S&P’s estimates, only four regions will be able to finance all the spending on their own: Moscow, St. Petersburg, Tatarstan and Krasnodar Region. The latter two have already received federal funds for infrastructure construction for the Universiade in Kazan and the Olympics in Sochi, respectively. For most other regions, the required spending exceeds their annual budget revenues (see chart): three times over for Kaliningrad and almost double for Samara. Kaliningrad and Samara will not be able to finance even a third of what is required unless the federal budget shoulders 70 percent of the cost. If the government pays for 50 percent, eight out of the remaining 11 regions will be able to handle the rest of the burden, according to S&P. The share of federal funds allocated (either directly or through state-owned companies and budget loans) to the regions in preparation for last year’s APEC summit, the 2013 Universiade in Kazan and the 2014 Sochi Olympics has exceeded 90 percent. Vartapetov noted that, while the regions’ appetites will need to be curtailed, the condition of their infrastructure is poor. “Perhaps the federal budget will need to play a much greater role in the preparations for the World Cup than was originally planned,” said the S&P deputy director. According to S&P, the government will face a tough dilemma: either increase investments in regional infrastructure, or watch the quality of the championship deteriorate. However, the government’s capabilities are much more limited now than they were before the crisis. The budget is already tough, and there are practically no resources left in it for redistribution, Russian Finance Minister Anton Siluanov stated in mid-April. It had already been determined that federal spending on the World Cup would not exceed 300 billion rubles ($10 billion) through 2018, with the government actually aiming for 250 billion rubles ($7.9 billion), a federal official said. 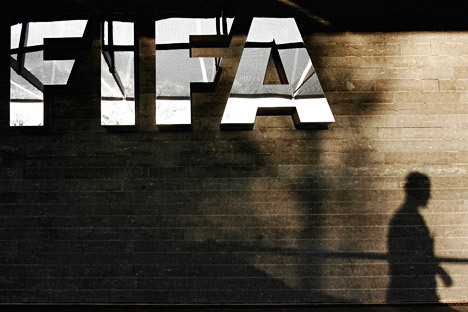 “This includes obligations to FIFA. There are also hotel obligations, but this is something for private investors to deal with,” the federal source said. The 300 billion rubles mentioned above exclude the cost of high-speed railways, which the Russian Ministry of Transport estimated at 290 billion ­rubles ($9.2 billion) ­ last autumn. Russian Railways put a 343-billion­-ruble ($10.9 billion) ­ price tag on them in April, but the decision has been postponed until summer. In addition to this, high-speed Moscow–St. Petersburg and Moscow – Nizhny Novgorod–Kazan railways, with a total cost estimated by Russian Railways at 1.5 trillion rubles ($47.5 billion), are planned for the World Cup.